Posted on 25, April 2016 by EuropaWire PR Editors | This entry was posted in Financial, Investment, Netherlands, Transportation & Logistics and tagged Harold Goddijn, Sport and B2B activities, TomTom. Bookmark the permalink. 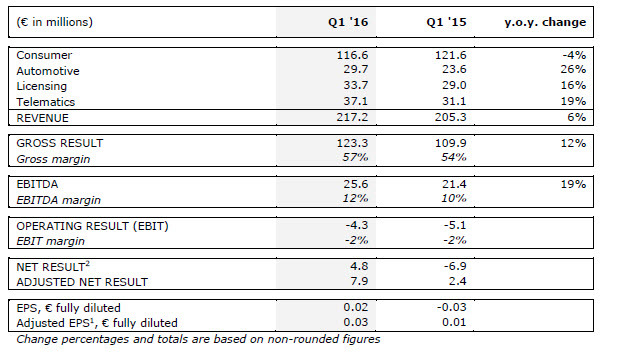 Full year outlook re-iterated; Revenue expected of around €1,050 million and adjusted EPS1 expected of around €0.23. “TomTom started the year with good revenue growth in Sport and B2B activities. Consumer Sport saw the sell-out nearly doubling year on year and the new sport watches are winning numerous awards, which is another proof point of success. Automotive delivered a strong performance and announced many customer deals during the quarter. We extended HD map and RoadDNA coverage in the quarter, enabling self-driving car testing in key regions of the US. Autonomous Driving continues to push boundaries; at TomTom we’re excited to be playing a role in enabling the automotive industry to bring this closer to reality. View the full TomTom reports first quarter 2016 results release in PDF format.